Looking for overlaps in ownership across hedge funds can help you find some good stocks. Do you sincerely want to beat the market? Well, here's one clever way to try and accomplish that difficult-to-achieve ambition. You can access, with some time delay, the largest holdings of the most successful hedge funds, like the 20 so-called Tiger Cubs set up by former employees of the highly successful Tiger hedge fund, folded in 2000 by founder Julian Robertson. 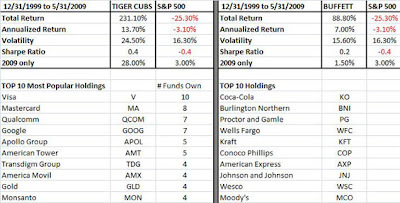 If you owned the top 10 stocks held by the Tiger cubs that emulate one another--hedge funds like Blue Ridge Capital, Lone Pine Capital, Maverick Capital, Tiger Global Management and Viking Global Investors--you'd be up 28% in 2009, far better than the Dow or S&P 500, which are barely better than flat. Plus you'd be way ahead of Berkshire's top 10 stock holdings, which have gained only 1.5% so far this year. Over the past 10 years, the Tiger Cubs, just on the basis of their top 10 equity holdings and not including their short positions, have returned 231.1%, or 13.7% on an annualized basis--compared to Buffett's annualized return of 7%. The margin of difference is due to the universe of stocks chosen. The Tiger Cubs had a large weighting in growth issues like credit card companies Visa ( V ) and MasterCard ( MA ) (see table below); growth stocks like Google ( GOOG ), Qualcomm ( QCOM ), Apollo Group ( APOL ) and American Tower ( AMT ). While Buffett's largest positions were Coca-Cola ( KO ), Burlington Northern ( BNI ), Procter & Gamble ( PG ), Wells Fargo ( WFC ), Kraft ( KFT ) and American Express ( AXP ). All these valuable tips on the market can come your way from an Internet investment service, Alphaclone.com, for $50 a month. And that outfit is hardly alone in tracking hedge fund holdings. Every hedge fund with more than $100 million in assets has to register with the SEC their stock holdings with a 45-day lag. This means that Alphaclone's listing of the cross ownership of the Tiger cubs is valid for the March 31 date, some two months ago. Still, the Tiger Cubs have a very low turnover rate of 15% on the average. It's also clear that the Tiger Cubs must be sharing investment ideas. Some 10 of them owned Visa; eight held Mastercard; seven had Qualcomm and Google; five were invested in Apollo Group and American Tower; and four of the cubs had positions in Transdigm Group ( TDG ), American Movil ( AMX ), SPDR Gold Shares ( GOLD ) and Monsanto ( MON ). Alphaclone gives equal weight to the top 10 holdings, which they believe is a better method of cloning. Investors can request any weighting of stocks and can choose any mix of hedge funds they'd like to emulate. Goldman Sachs ( GS ) has been selling this service for the last few years to wealthy investors as well. They simply take the 13F filings of the hedge funds and create baskets of the stocks with the most overlap. Taken to the extreme, this strategy can mean a heightened correlation in the market where hot money keeps trying to follow the hedge funds who themselves are competing to beat the market and show a better return than their competitors. You need to be cautious about this strategy. Last fall, the no-brainer trade was to go short the most widely held basket of hedge fund holdings, because illiquid hedge funds needed to quickly liquidate their largest positions to deleverage in panicky conditions. There's also the drawback that some of these stocks may have run up substantially since March 31, making them a relatively less attractive play right now. Both Visa and Qualcom have rallied about 33% since the March 31 cutoff date. Be aware it is possible that the Tiger Cubs may well have lightened their positions or liquidated them completely. You won't be able to access their selling until the next reporting period, which will be in July for the period ending June 30. By comparison, you can pretty well count on long-term investor Warren Buffett to continue holding his largest positions, as he can never liquidate them unless the companies merge or are bought out. Copycatting is not a riskless sport.